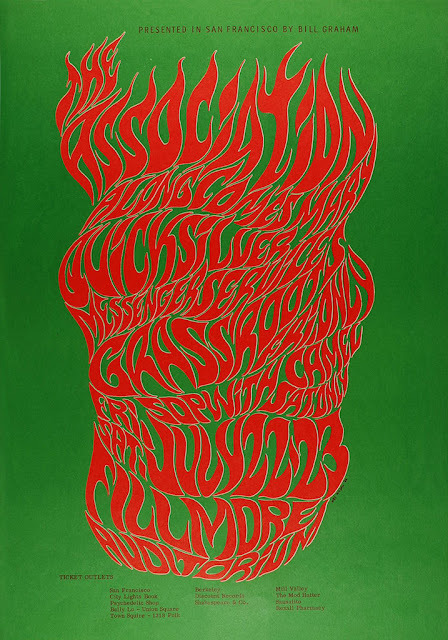 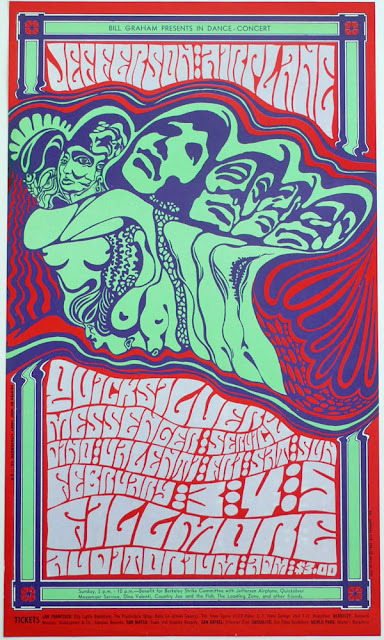 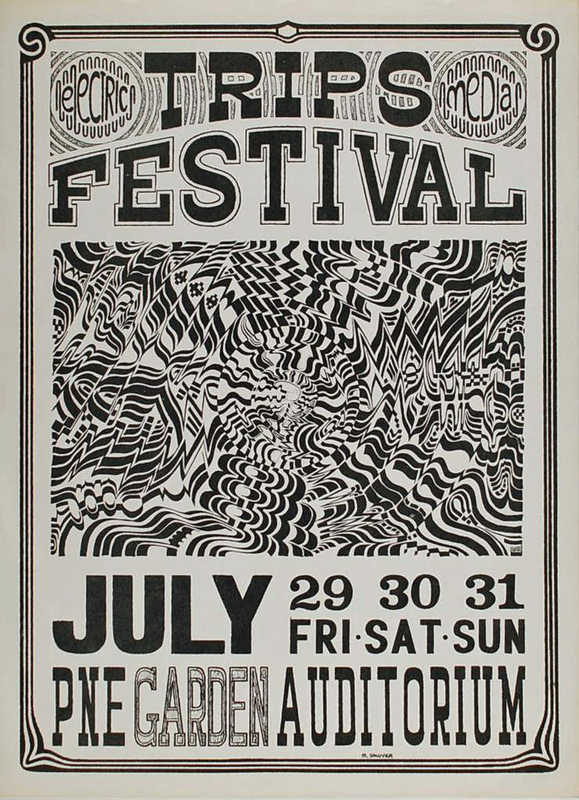 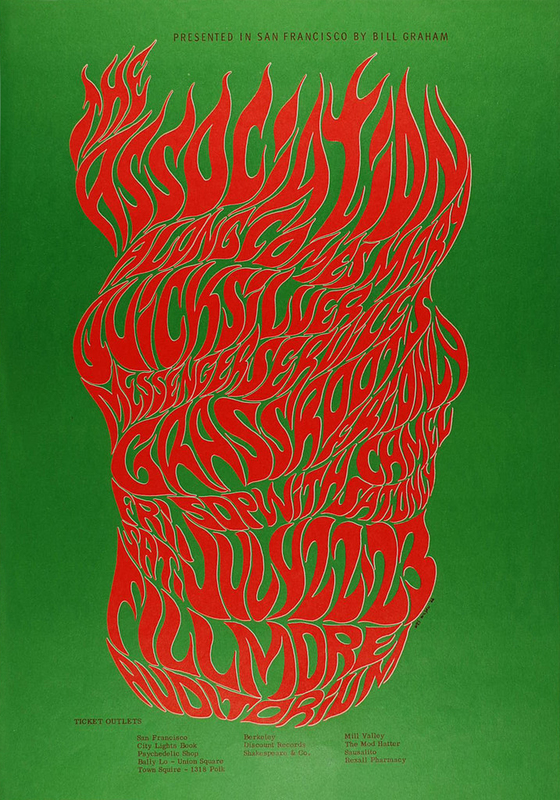 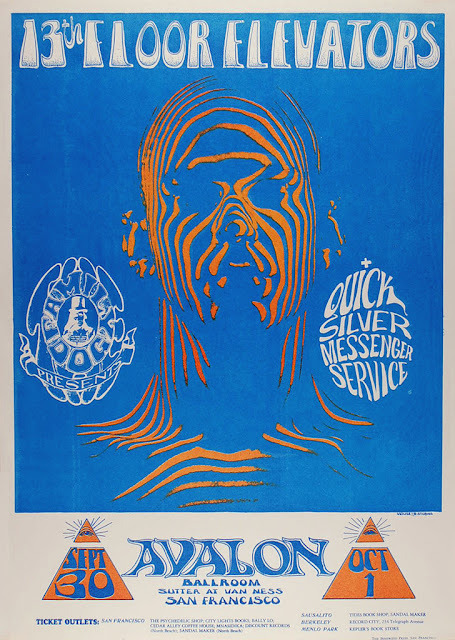 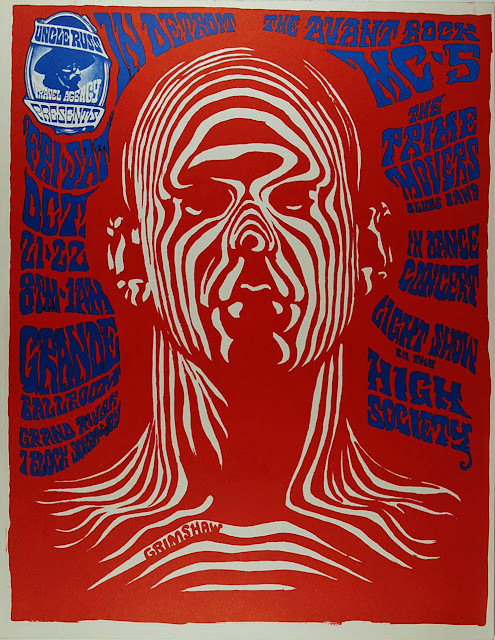 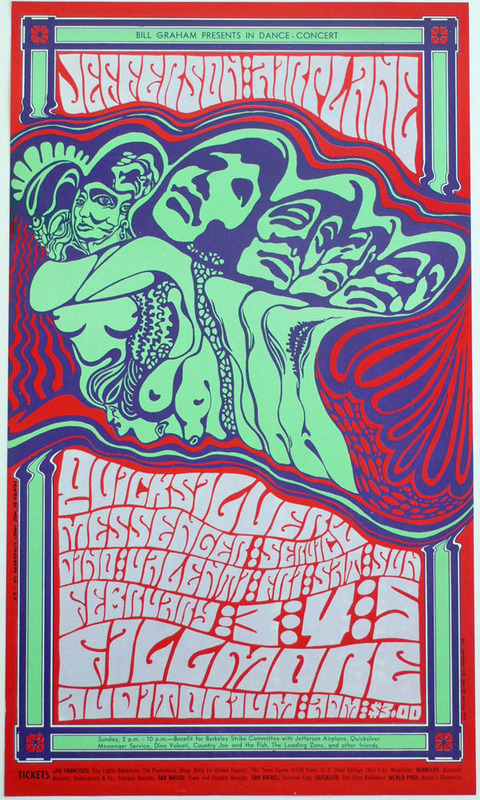 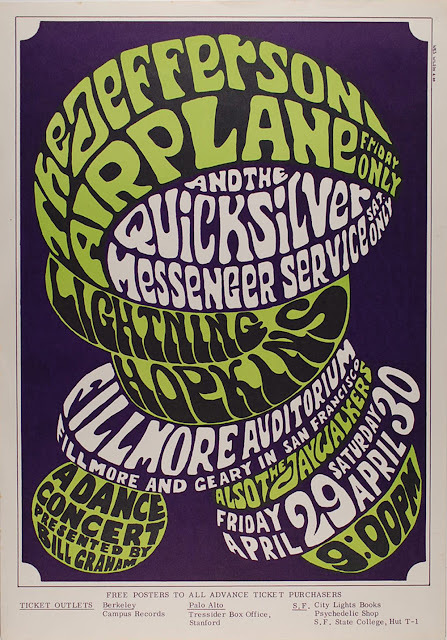 Leading artists of the 1960s Psychedelic Art movement were San Francisco poster artists such as Wes Wilson, Mouse & Kelly (Stanley Mouse and Alton Kelly), Victor Moscoso, Rick Griffin. 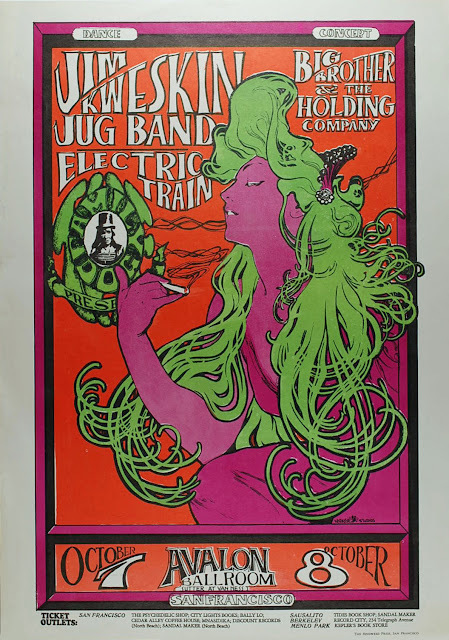 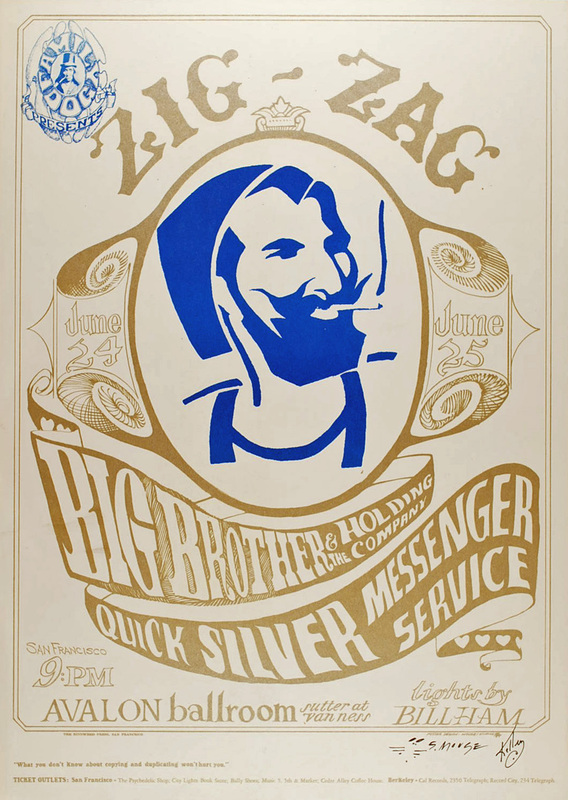 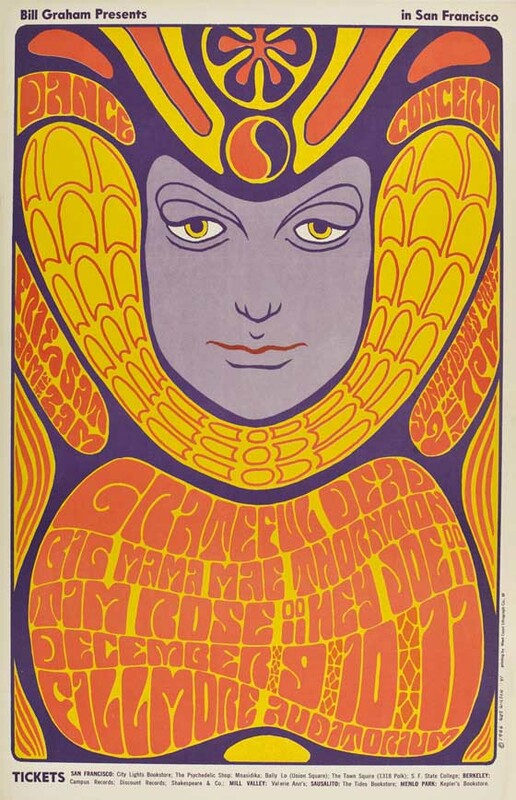 Their Psychedelic Rock concert posters were often inspired by the Art Nouveau style (of artists like Alphonse Mucha – indeed his artworks were often reworked in posters), as well as the contemporary Pop Art movement. 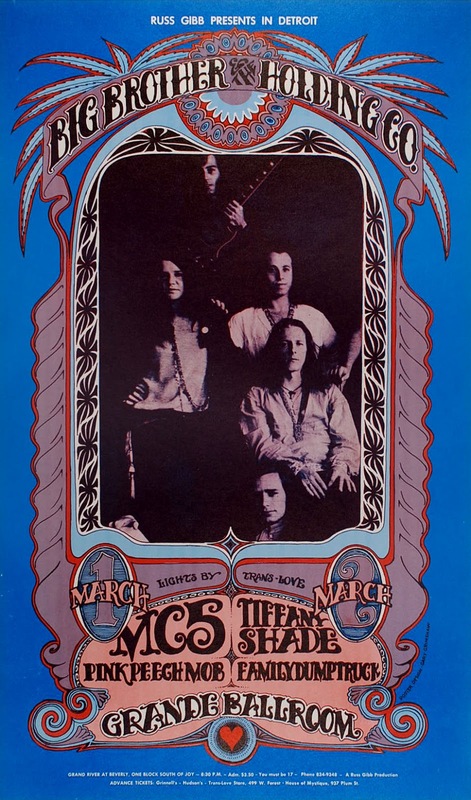 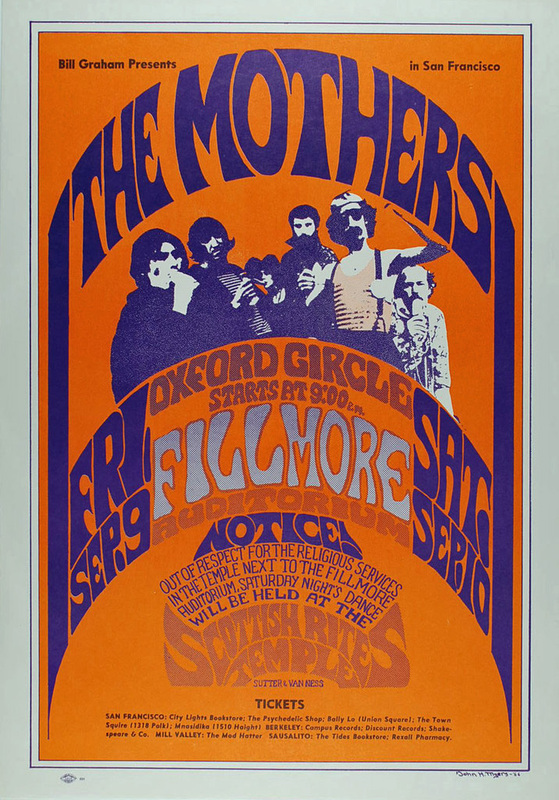 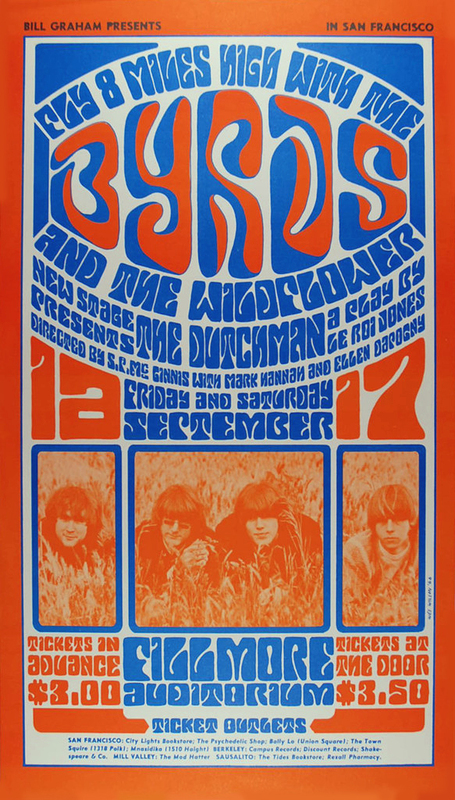 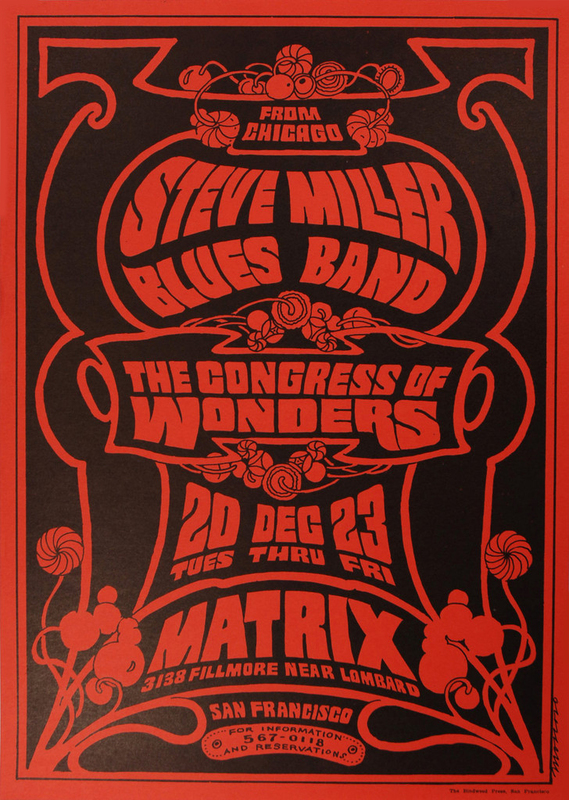 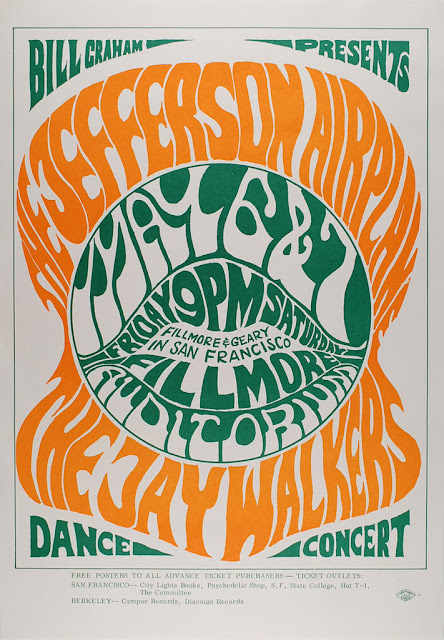 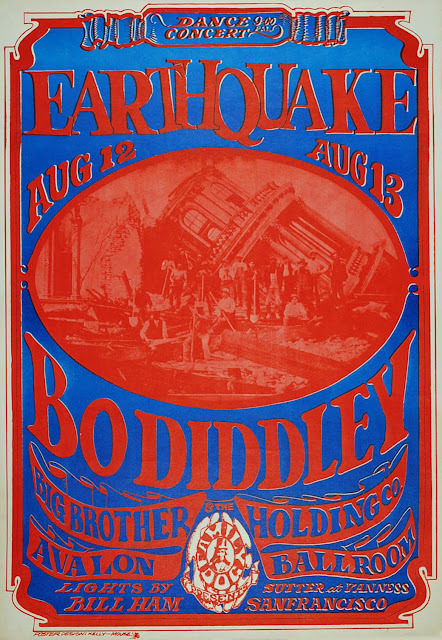 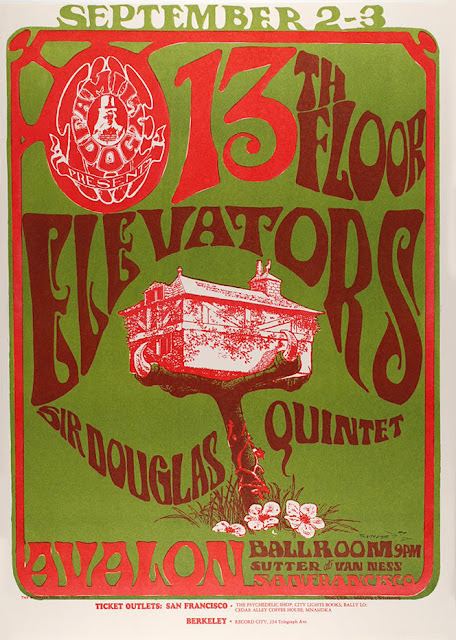 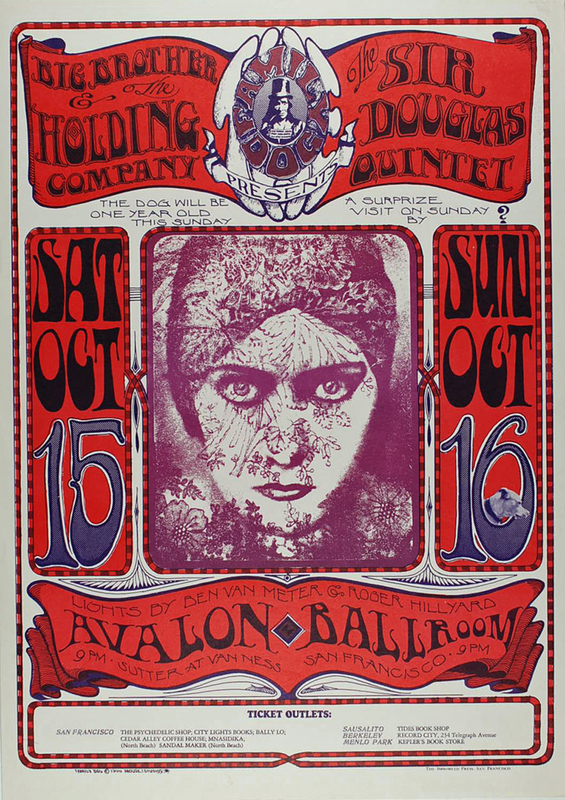 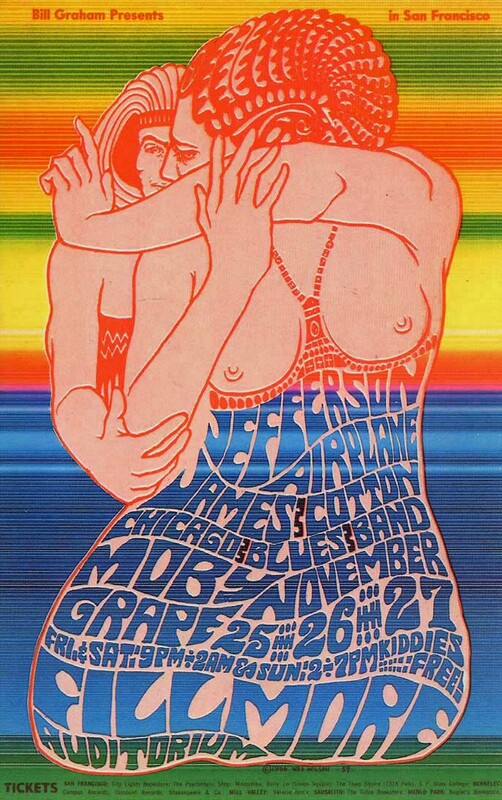 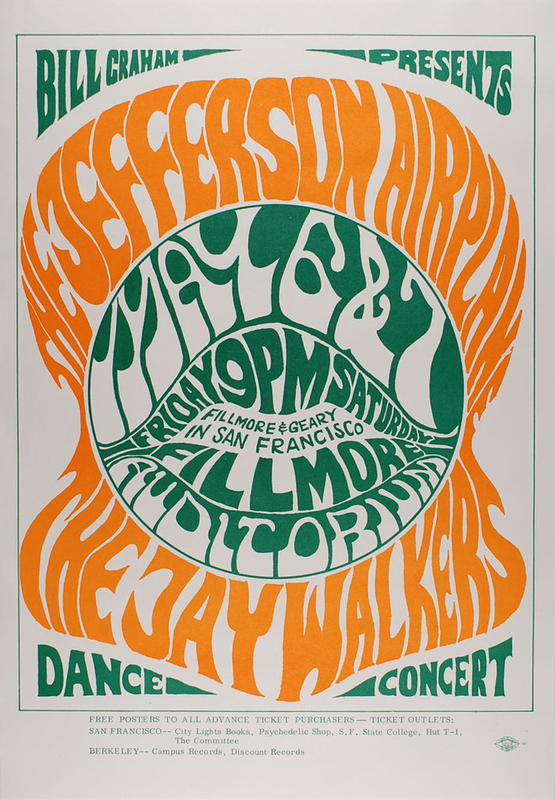 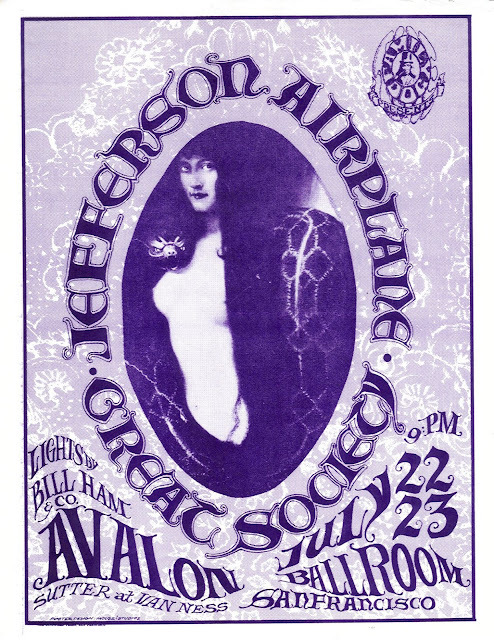 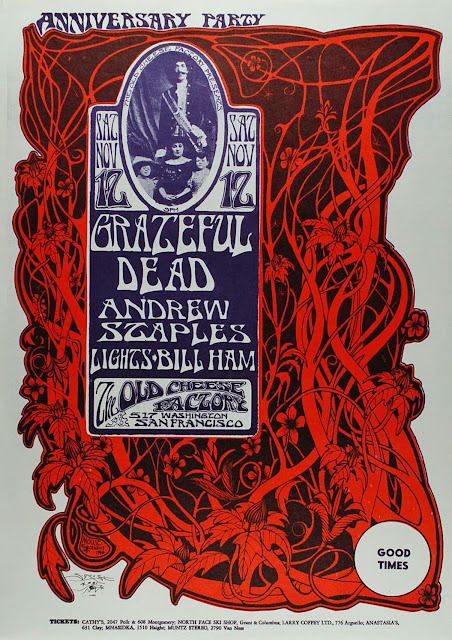 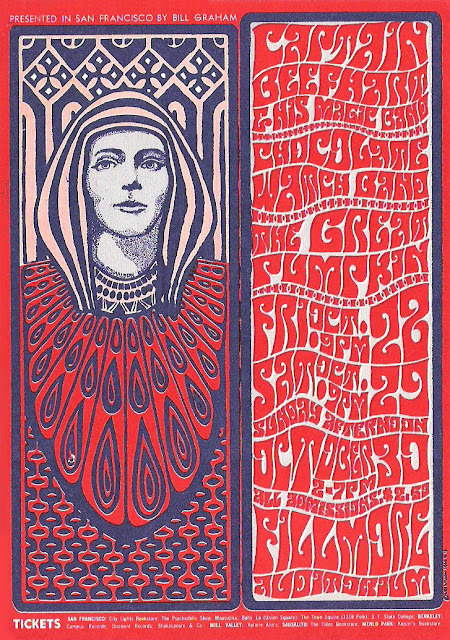 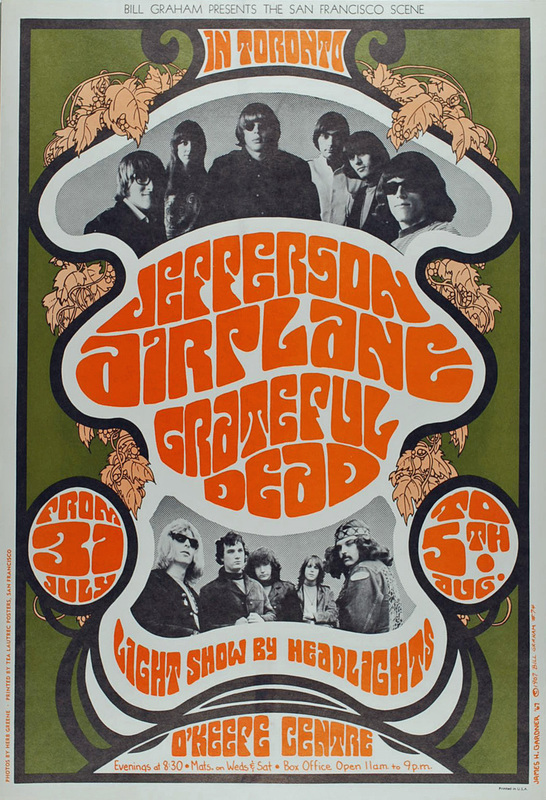 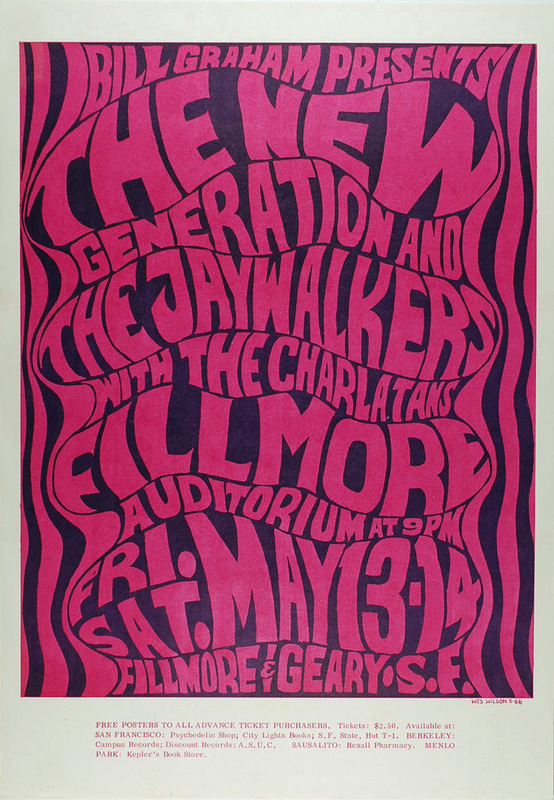 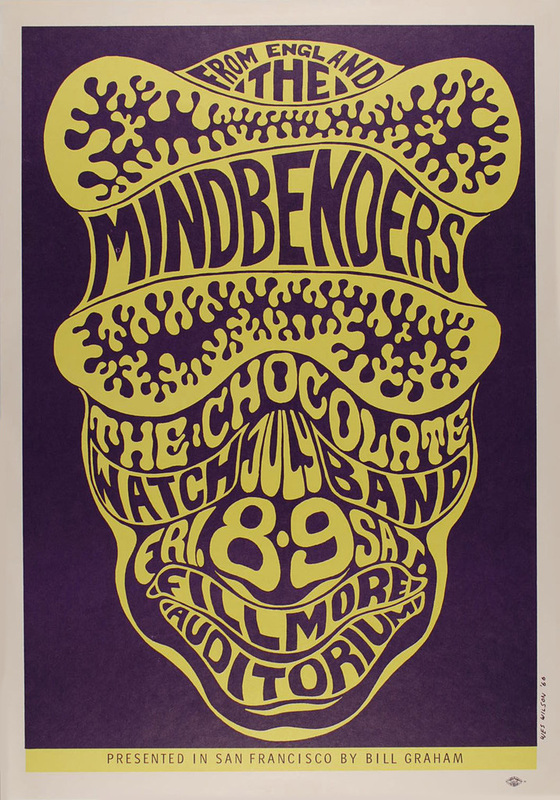 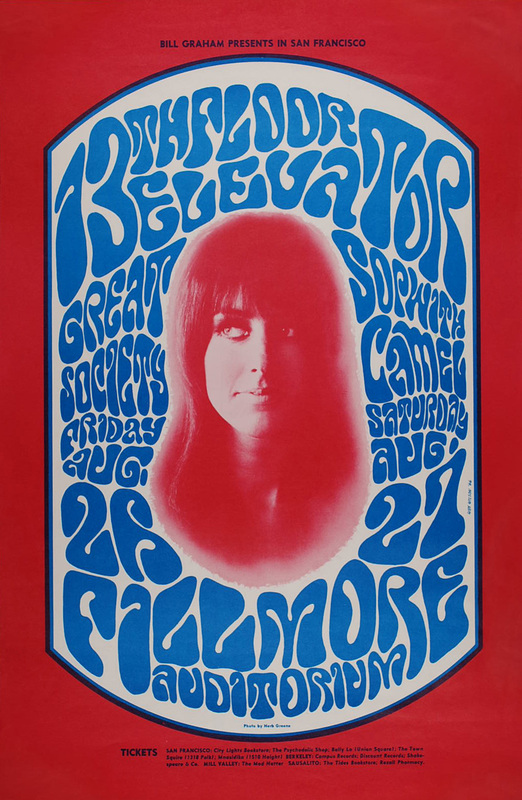 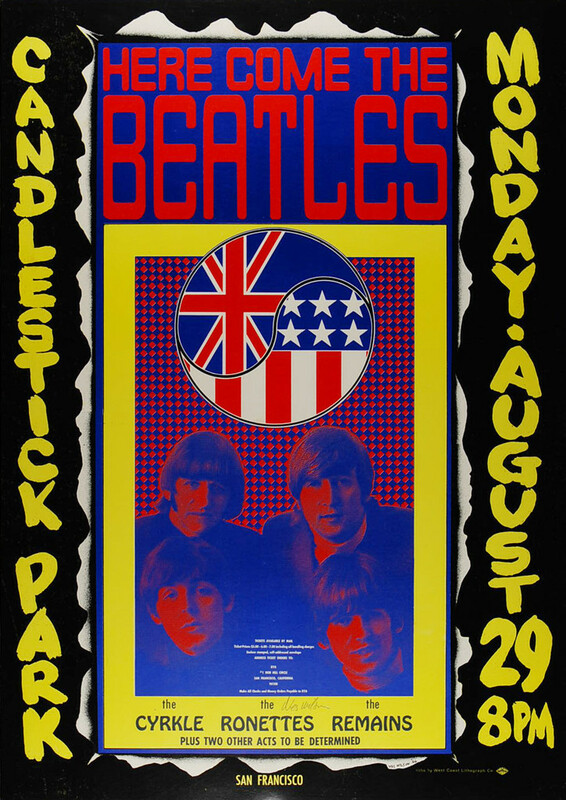 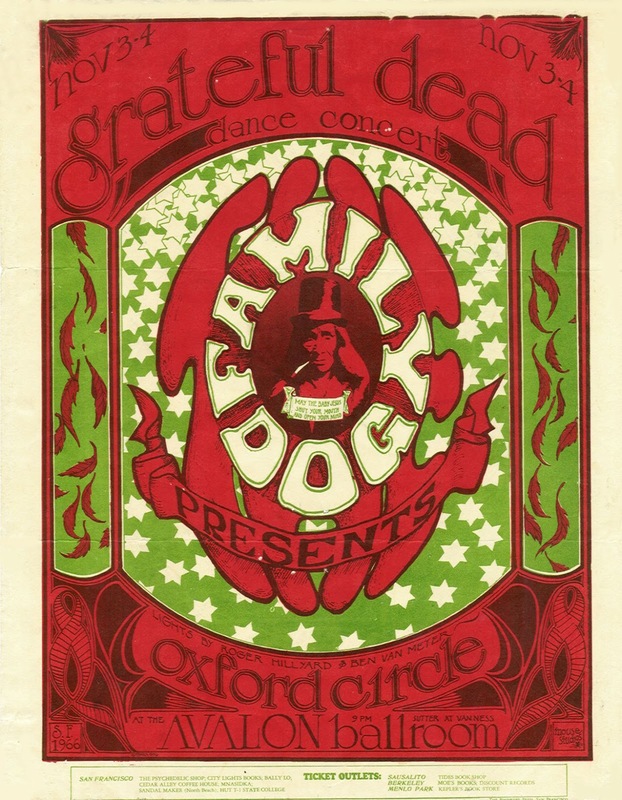 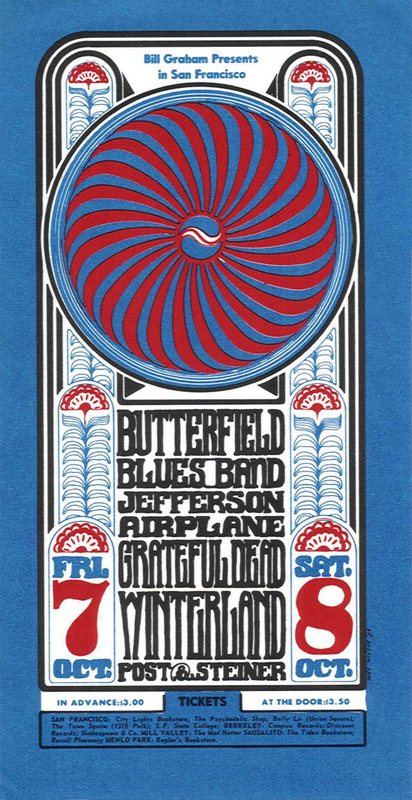 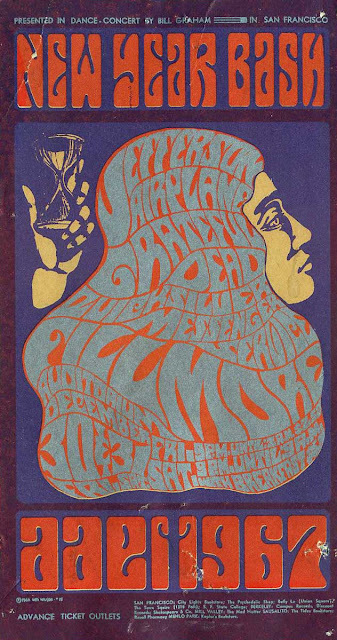 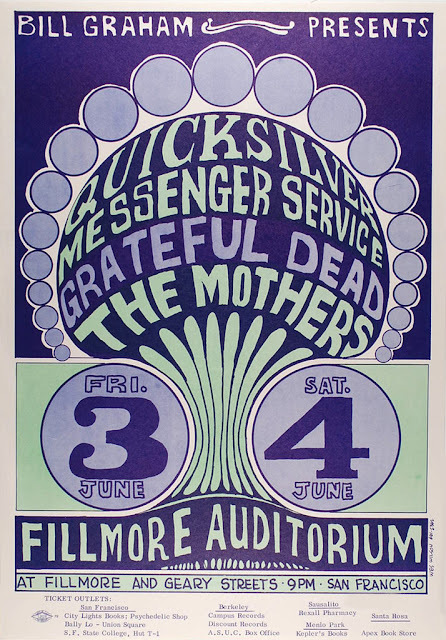 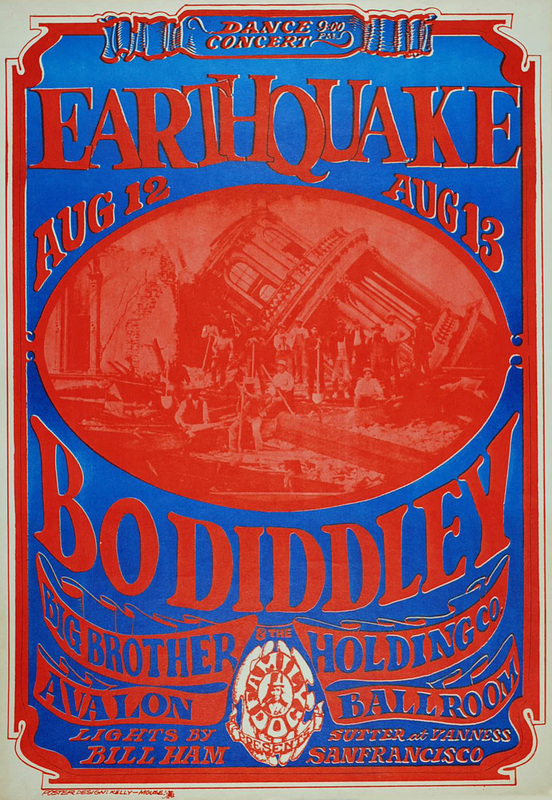 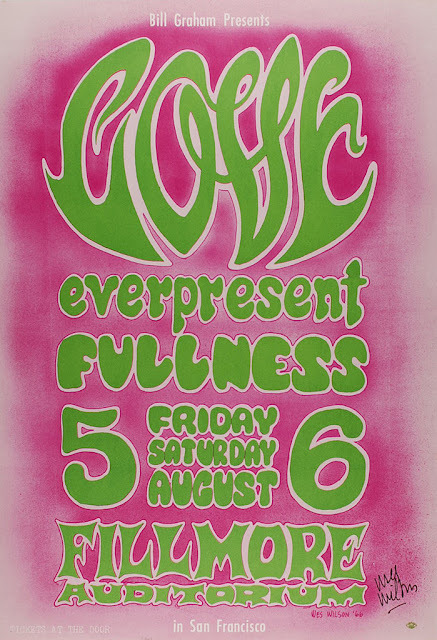 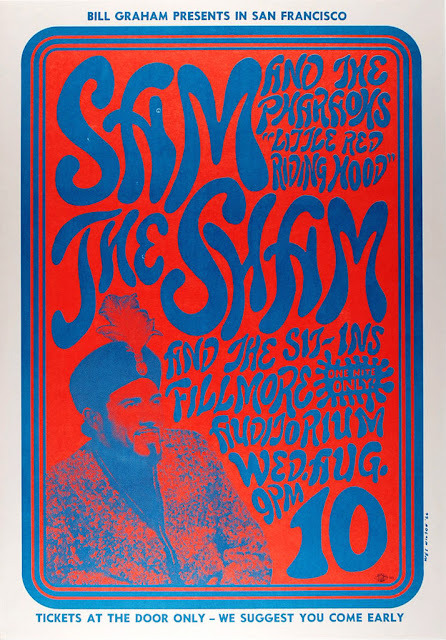 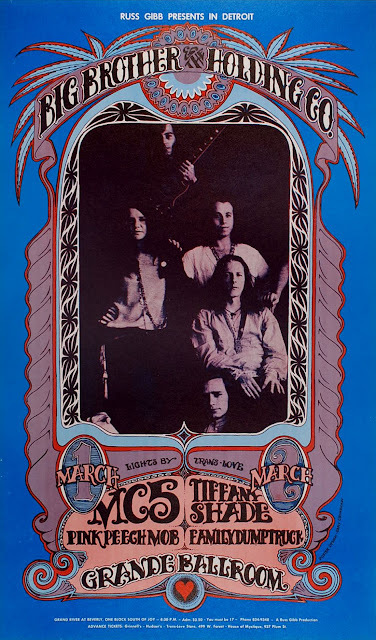 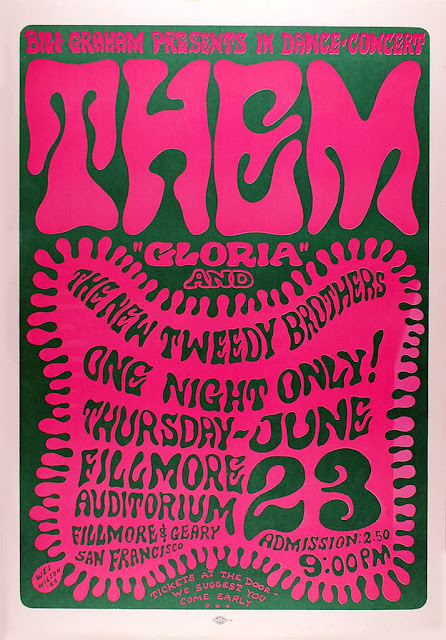 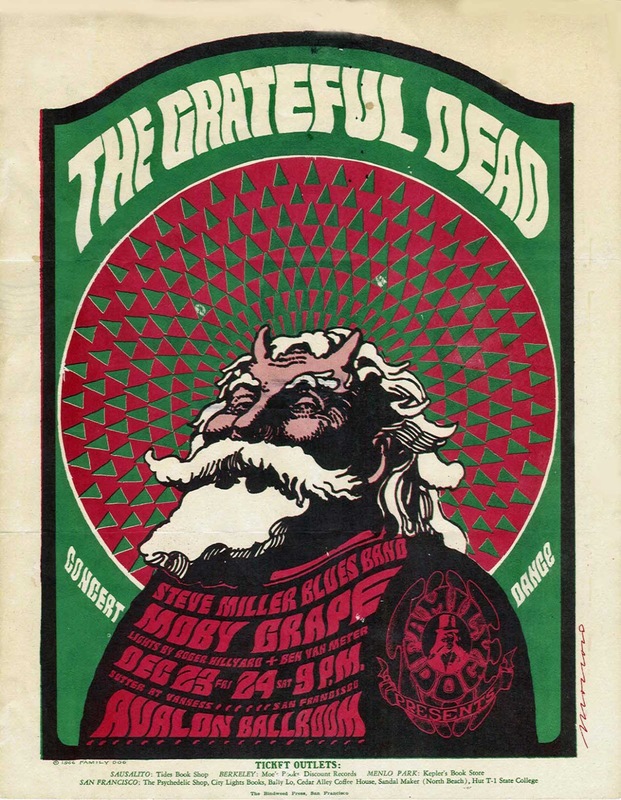 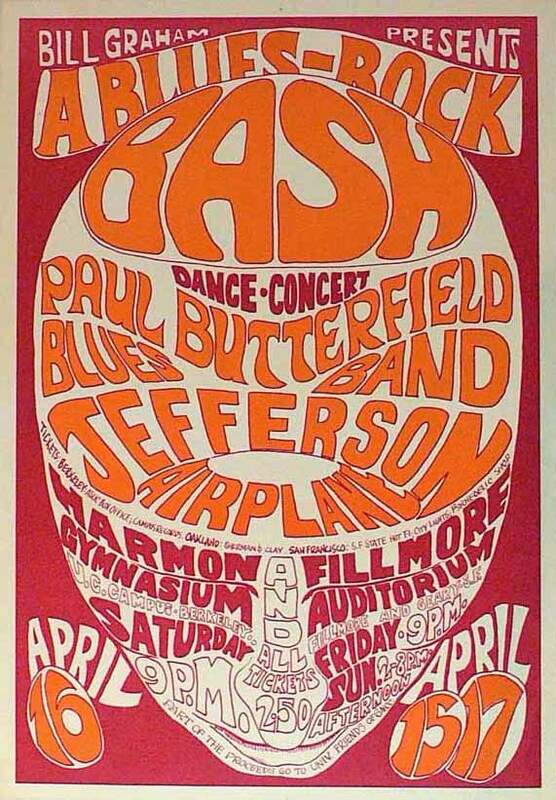 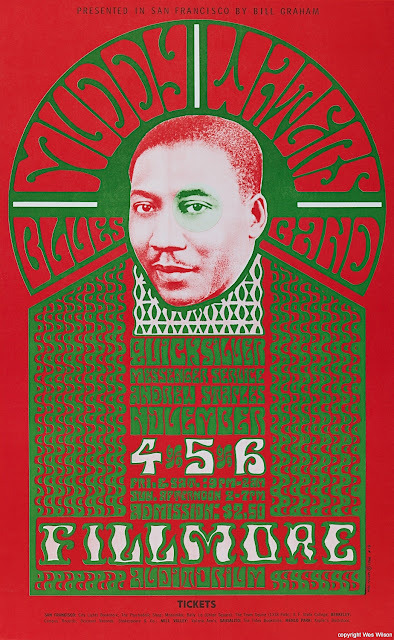 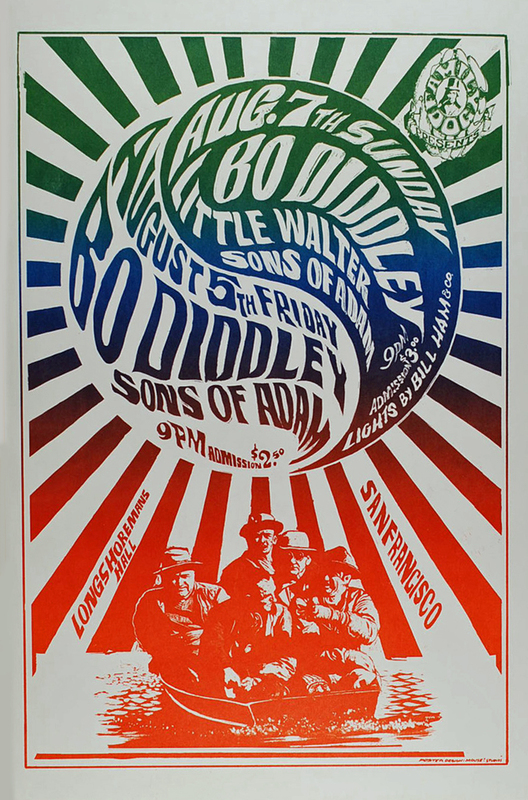 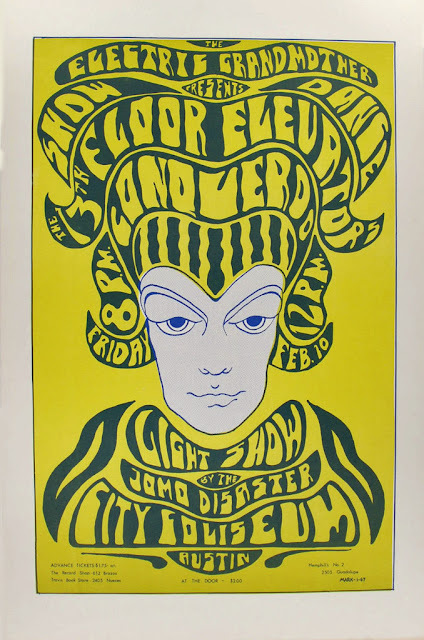 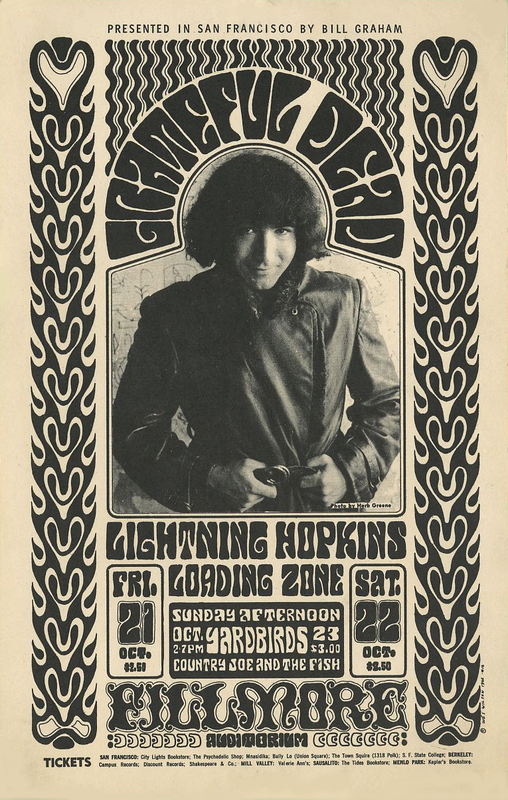 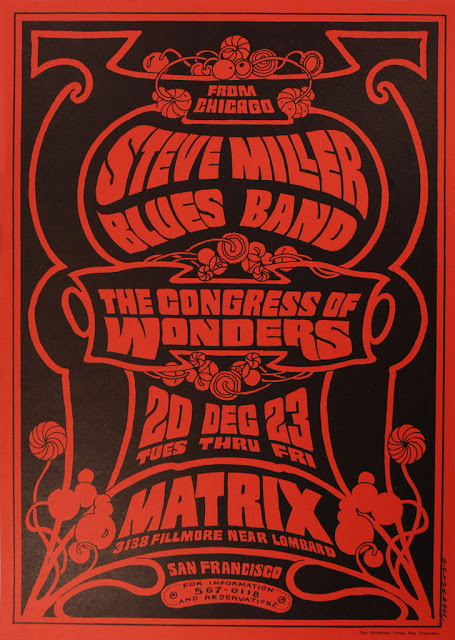 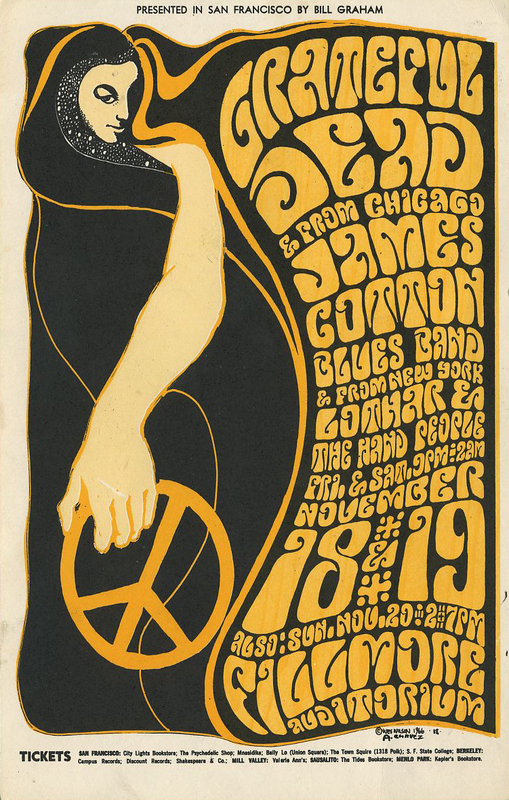 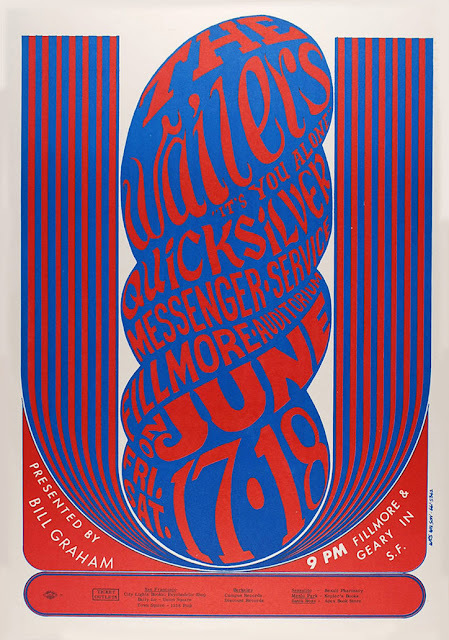 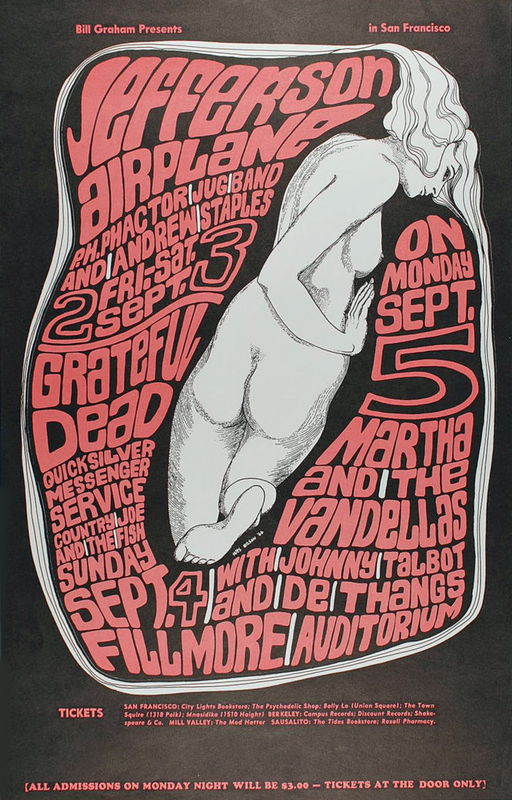 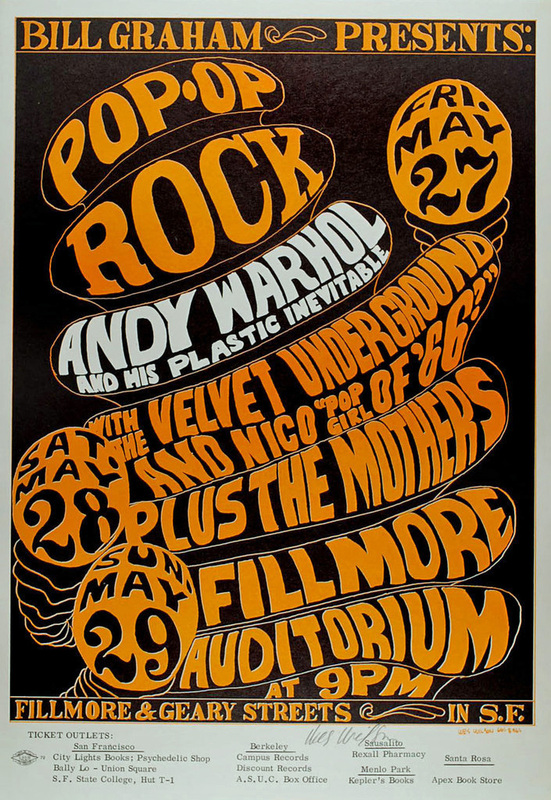 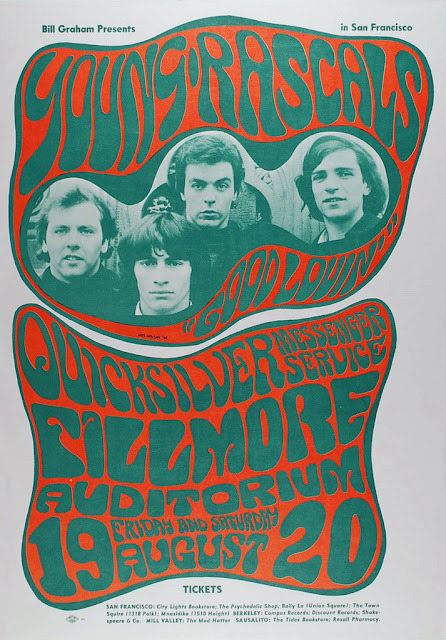 The "Fillmore Posters" were among the most notable of the time. Richly saturated colours, elaborate ornate lettering, collage elements and distortion were all hallmarks of the San Francisco psychedelic poster art style that flourished from about 1966 - 1972. 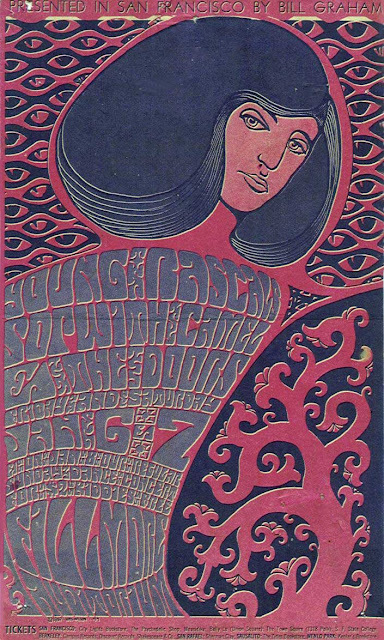 Their work also translated into album cover art and all of the aforementioned artists also created album covers. The Fillmore Auditorium is an historic music venue in San Francisco California made famous by promoter Bill Graham. 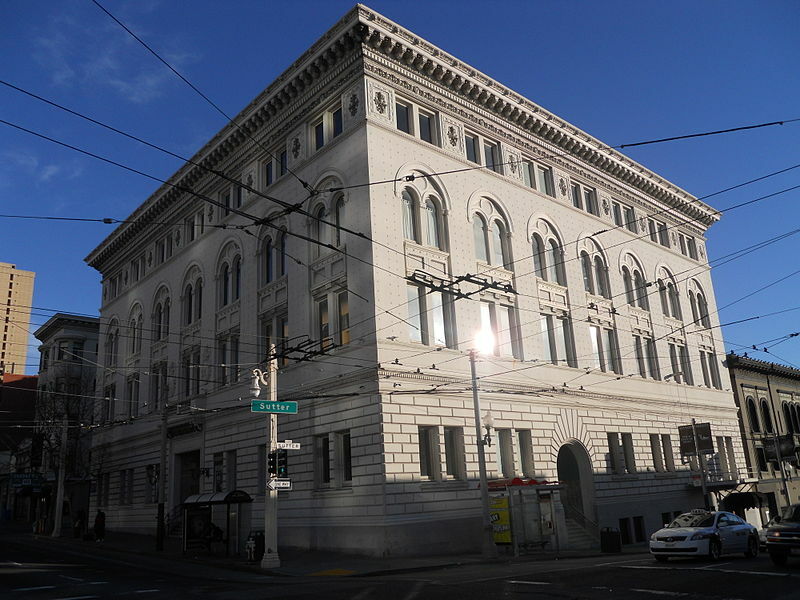 Named for its original location at the intersection of Fillmore Street and Geary Boulevard. 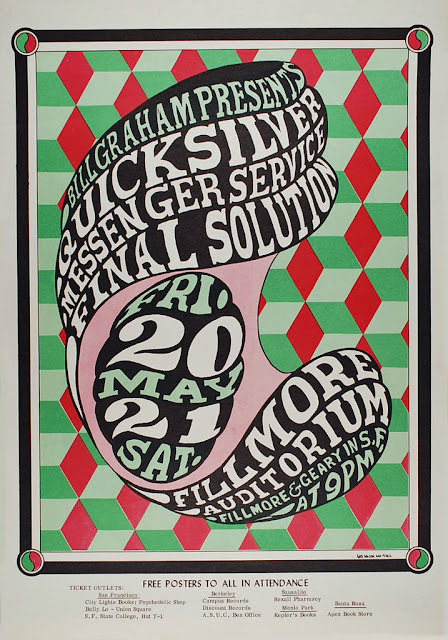 In 1968, Graham moved his concerts to a different venue in San Francisco, formerly known as The Carousel Ballroom and El Patio at Market Street and South Van Ness Avenue, that he renamed Fillmore West. 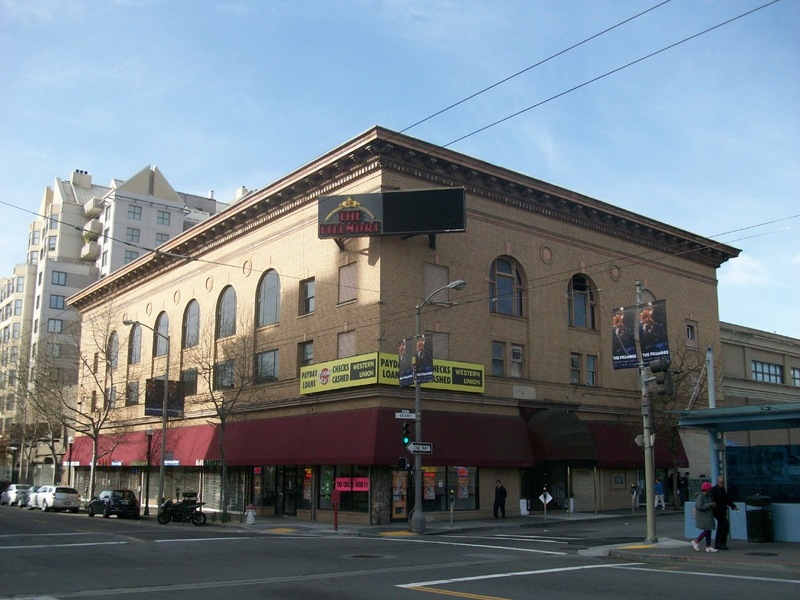 The Avalon Ballrom is a music venue in the Polk Gulch neighbourhood of San Francisco. 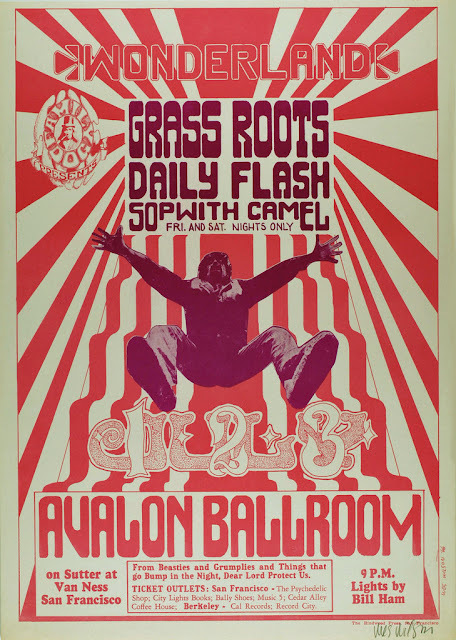 The space operated fron 1966 to 1968 and reopened in 2003. 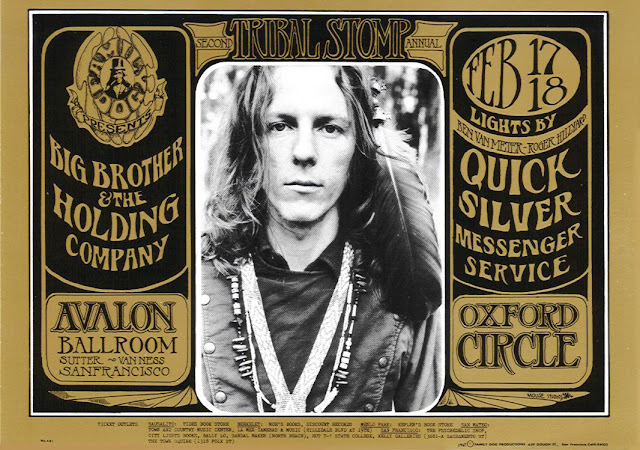 Local bands such as Quicksilver Messenger Service and The Steve MIller Band served as back-up bands, as did the early Moby Grape and headliners like The Doors and Big Brother and the Holding Company with Janis Joplin. 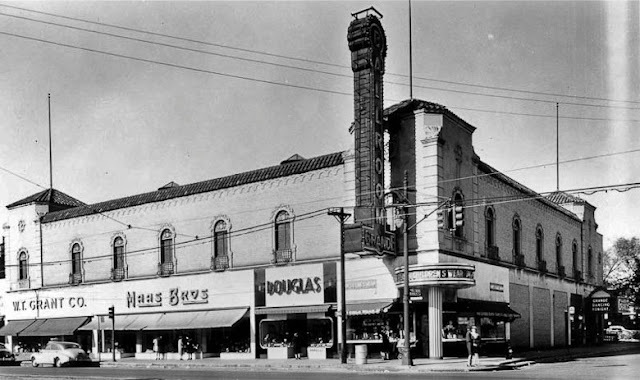 In 1966 the Grande Ballroom was acquired by high school teacher and local radio DJ Russ Gibb. 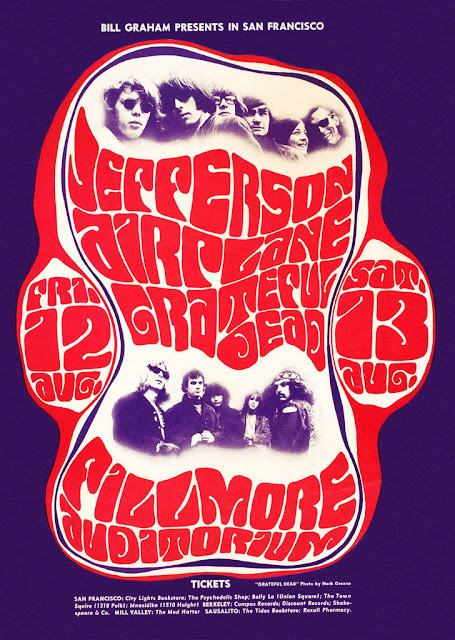 He was inspired by visiting the Fillmore in San Francisco, and envisioned a similar venue in Detroit for the new psychedelic music. 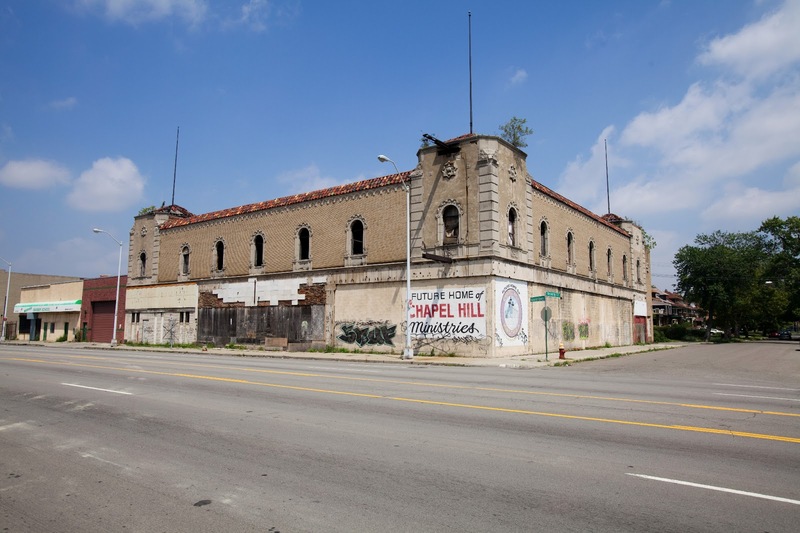 Since Gibb closed the Grande as a rock venue in 1972, the building has rarely been used and has fallen into a state of extreme disrepair. 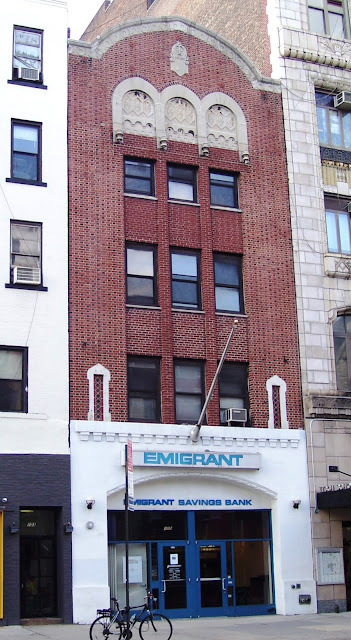 Fillmore East was rock promoter Bill Graham's venue in the East Village in New York. 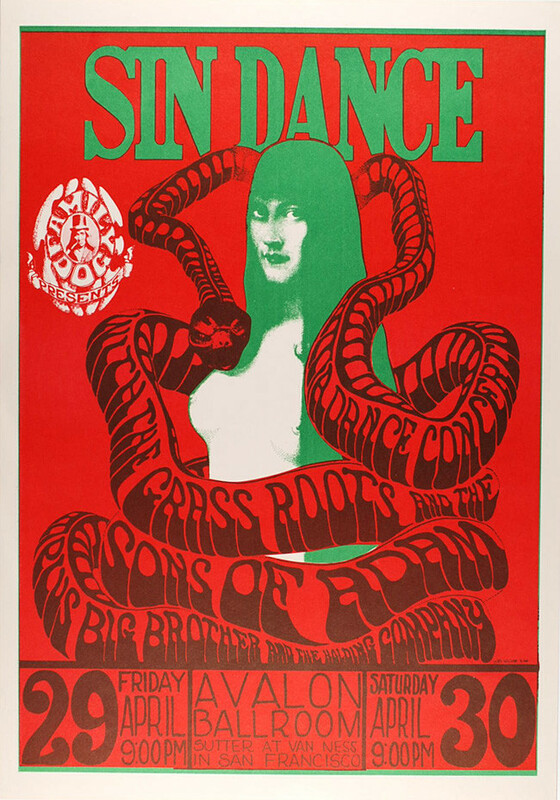 It was open from 1968 to 1971 and featured some of the biggest bands of the time. The venue provided Graham with an East Coast counterpart to his existing Fillmore in San Francisco. 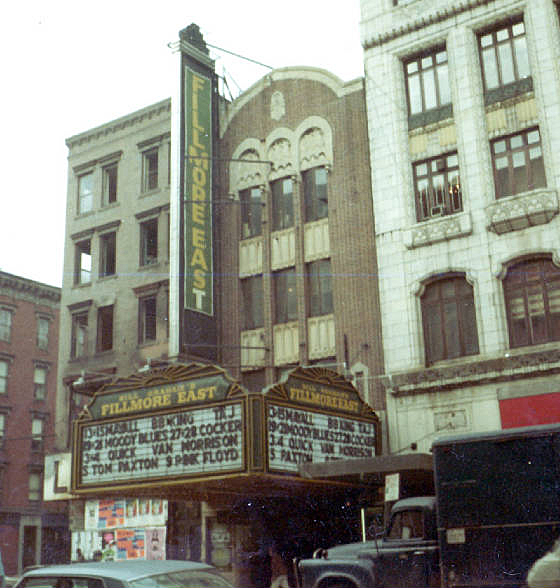 The Fillmore East quickly became known as "The Church of Rock and Roll," with two-show, triple-bill concerts several nights a week. Graham would regularly alternate acts between the East and West Coast venues. 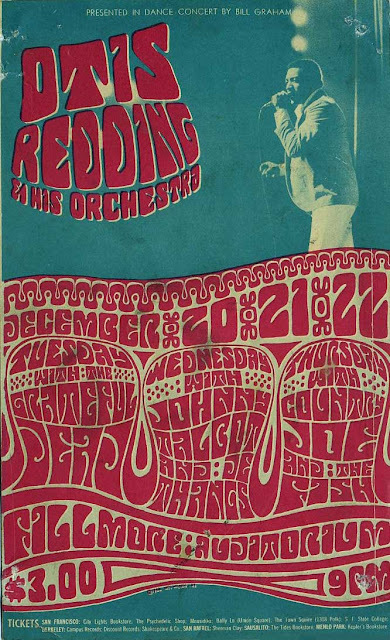 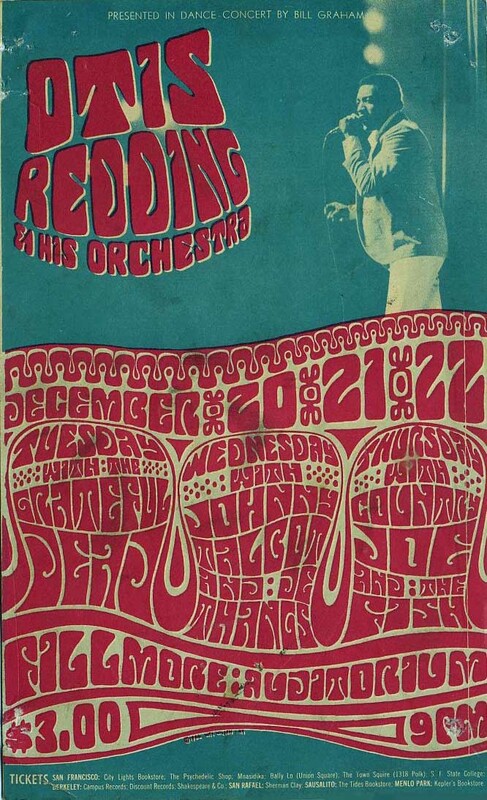 Until early 1971, bands were booked to play two shows per night, at 8 pm and 11 pm, on both Friday and Saturday nights. 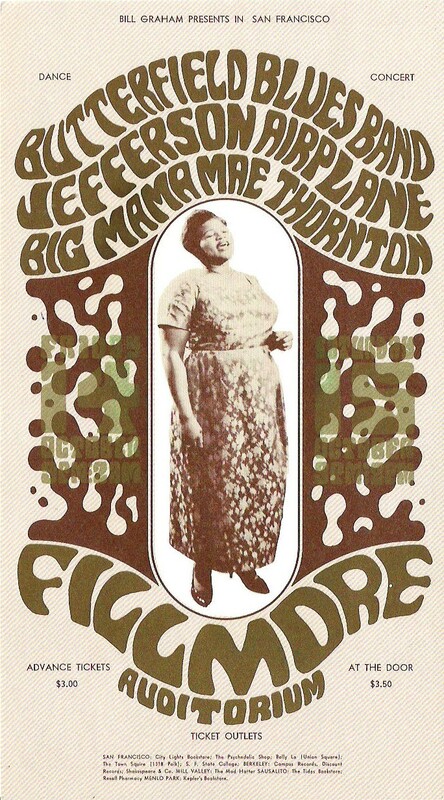 Not heard of him/her I'm afraid.